Almost every conservation plan has two goals. The first goal is to protect a species from harm. The second goal is to protect the species' habitat. Several conservation strategies can be used to meet these goals. Legal Protections Laws can be passed to help protect a species and its habitat. In the early 1970s, people became concerned about the growing number of species extinctions occurring in the United States. In response to this concern, Congress passed the U.S. Endangered Species Act of 1973. This act makes it illegal to harm, collect, harass, or disturb the habitat of any species on the endangered or threatened species lists. The act also prevents the U.S. government from spending money on projects that would harm these species or their habitats. The Endangered Species Act has helped several species, including those shown in Figure 14, recover from near extinction. The United States and other countries worldwide have agreed to work together to protect endangered or threatened species. In 1975, The Convention on International Trade in Endangered Species of Wild Fauna and Flora, known as CITES, came into existence. One of its goals is to protect certain species by controlling or preventing international trade in these species or any part of them, such as elephant ivory. About 5,000 animal species and 25,000 plant species are protected by this agreement. Visit booke.msscience.com for Web links to information about endangered species. Activity Research an endangered or threatened species. Write a description of the species and explain why it is considered in danger. Marine Biodiversity The marine fish catch has an estimated value of $80 billion per year. Marine environments also provide us with raw materials and medicines. Other uses of marine environments include research, eco-tourism, and recreation. Research and then describe in your Science Journal what is being done to protect marine environments. Habitat Preservation Even if a species is protected by law, it cannot survive unless its habitat also is protected. Conservation biology often focuses on protecting habitats, or even whole ecosystems. One way to do this is to create nature preserves, such as national parks and protected wildlife areas. The United States established its first national park— Yellowstone National Park—in 1872. At that time, large animals like grizzly bears, elk, and moose ranged over much of North America. These animals roam across large areas of land in search of food. If their habitat becomes too small, they cannot survive. The grizzly bear, for example, requires large quantities of food each day. To feed itself, a grizzly needs a territory of several hundred square kilometers. Without national parks and wildlife areas, some animals would be far fewer in number than they are today. Wildlife Corridors The successful conservation of a species like the grizzly bear requires enormous amounts of land. However, it is not always possible to create large nature preserves. One alternative is to link smaller parks together with wildlife corridors. Wildlife corridors allow animals to move from one preserve to another without having to cross roads, farms, or other areas inhabited by humans. 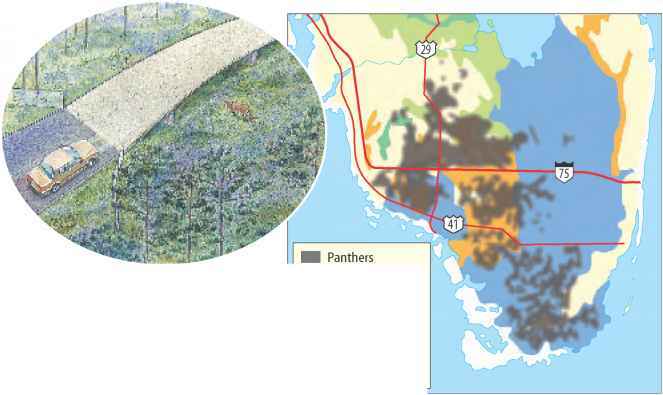 As Figure 15 shows, wildlife corridors are part of the strategy for saving the endangered Florida panther. A male panther needs a territory of 712 km2 or more, which is larger than many of the protected panther habitats. Figure 15 Some wildlife corridors (left) allow animals to pass safely under roads and highways. This map shows the types of habitat where most populations of Florida panthers are found. Notice the major highways that cross these areas. 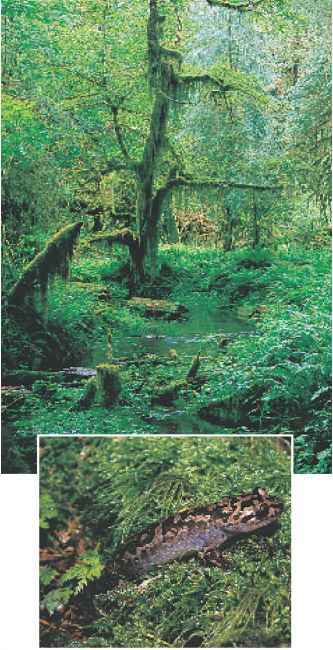 Habitat Restoration Habitats that have been changed or harmed by human activities often can be restored. Habitat restoration is the process of taking action to bring a damaged habitat back to a healthy condition. Island grew, most of the bay's eelgrass beds disappeared. Fish and shellfish populations declined. People who lived in the area knew that something needed to be done. Students in Rhode Island schools have helped restore eelgrass habitat by growing thousands of eelgrass seedlings for transplanting into the bay, as shown in Figure 16.
a^if3mnTTTHirn?J When is habitat restoration used? 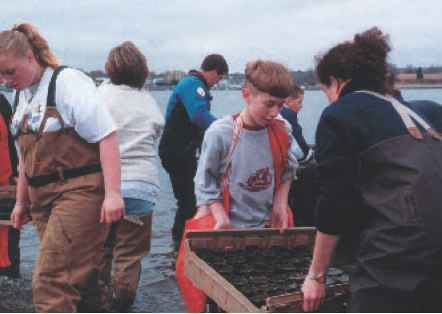 Figure 16 By restoring eelgrass habitat, conservation biologists hope to preserve populations of shellfish and fish in Narragansett Bay. Describe how the restoration of eelgrass habitat will help preserve populations of shellfish and fish. Wildlife Management Preserving or restoring a habitat does not mean that all the species living there are automatically protected from harm. Park rangers, guards, and volunteers often are needed to manage the area. In South Africa, guards patrol wildlife parks to prevent poachers from killing elephants for their tusks. Officials protect the mountain gorillas of Rwanda by limiting the number of visitors allowed to see them. Some wildlife preserves allow no visitors other than biologists who are studying the area. Hunters and wildlife managers often work together to maintain healthy ecosystems in parks and preserves. People usually are not allowed to hunt or fish in a park unless they purchase a hunting or fishing license. The sale of licenses provides funds for maintaining the wildlife area. It also helps protect populations from overhunting. For example, licenses may limit the number of animals a hunter is allowed to take or may permit hunting only during seasons when a species is not reproducing. Hunting regulations also can help prevent a population from becoming too large for the area.